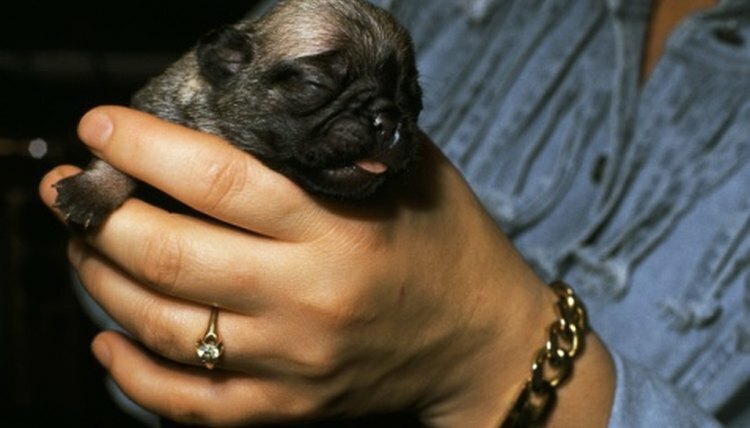 When you whelp, or birth, puppies, it is imperative that you keep the temperature warm so as to prevent illness and death of the newborn puppies. It is also crucial that you be able to keep the area clean. Choosing a whelping area that easy to disinfect and inexpensive to prepare will help you in the short-term and long run as you breed. This should be done well in advance to prevent any unnecessary complications in the whelping area. Select a suitable spot in your home for the whelping area. The room should be barricaded off with a baby gate or should have a door that closes. The flooring should be easy to keep clean — preferably not a carpeted area. If at all possible, keep the female in a quiet area of the home so she can rest quietly with her babies once they're born without being disturbed by people or other pets walking in and out of the room. Clean out the room so that there will be nothing that can harm your female as she whelps. She also should have access to fresh water. Put one plastic wading pool down on the floor. Lay an electric blanket inside and place the second baby pool down inside the first so that the electric blanket is between the two pools. Place a clean blanket in the top pool when the female gets close to the time to whelp the puppies. Keep several clean blankets handy so that they can be replaced as needed during the whelping process. Turn on the electric blanket on low or medium once the puppies have been born. Check the temperature with your hand. The room temperature should be kept around 75 degrees if possible. If this room temperature is not possible, the electric blanket underneath the wading pool will keep the puppies warm. Clean the wading pool daily with bleach and water. The mixture should have 32 tsps. of bleach to one gallon of water. Replace blanket daily as well. The puppies can grow up in the wading pool until they are about three weeks old, depending on the breed and size of the puppies. Clean the puppy area daily. Put the puppies into a crate or box lined with a warm towel while you clean the puppy whelping area. Keep the room gated so that other dogs don't get in and people don't disturb the mother dog. Puppies sicken quickly if they get cold. Their internal body "thermometers" don't kick in until they are about two weeks old, and they must be kept warm with external temperatures. Keep a room thermometer handy and watch that the temperature in the room stays warm for at least two weeks.